One person has been killed and several injured after an accident on a ride at the Ohio State Fair. 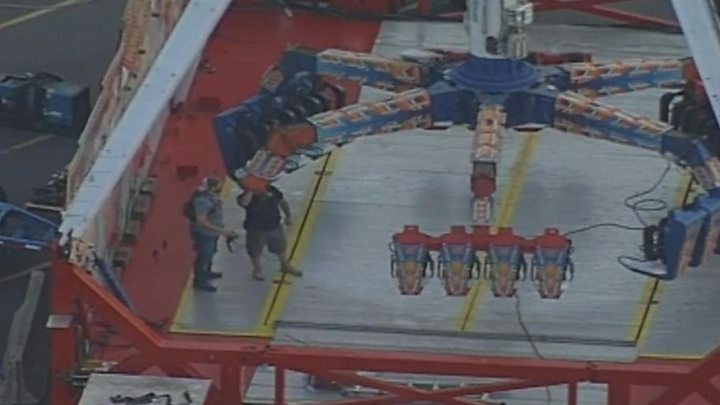 Fire chief Steve Martin told local media outlets that victims were thrown from the "fireball" spinning pendulum ride in the city of Columbus. Three of the injured are in a critical condition, officials said. State Governor John Kasich confirmed at least one death, and said he had ordered all fair rides shut until safety inspections were carried out. He also said a full investigation would be carried out. The fireball ride swings from side to side while simultaneously spinning passengers in circles at high speed. It is known by the name "afterburner" in European markets. Speaking to reporters, a doctor treating some victims said: "Passengers were ejected at high speed with high energy, many feet - at least 20 or 30, if not more - into the air, and then crashed at a significant distance from the ride." He said the speed of the impact could be similar to a vehicle crash. A video circulating online appeared to show one passenger carriage breaking loose near the bottom of its pendulum swing, tossing passengers into the air as it rose again. The state fair confirmed on Twitter that there was "a report of a ride incident" but provided no further details. Local NBC affiliate WCMH reported that one of the injured is a 13-year-old child. Multiple local news outlets have said the deceased is an 18-year-old. The accident took place on Wednesday evening, the opening day of the fair. The Columbus Dispatch reported that safety inspections of the rides had taken place earlier in the week. Chief inspector Mike Vartorella said: "My grandchildren ride this equipment… our guys do not rush through this stuff. We look at it, we take care of it, we pretend it's our own." He said the ride was inspected "three or four times" in the past two days by both his own inspectors and a "third party".